Gilli Smyth, co-founder of Gong alongside Daevid Allen, formed Mother Gong with Harry Williamson in 1978. Mother Gong's Robot Woman trilogy is widely accepted as one of the pinnacles of the band's career. Previously only available on 3 vinyl LP releases pressed in small number in the 1980s this long-awaited release heralds the first appearance of Robot Woman 1, 2 and 3 on CD, something devoted Gongsters have been requesting for years. Also included is a fourth disc of fascinating 'Demos and Rarities'; 18 previously un-released unknown and hidden extras, the earliest of which dates from 1976. The audio on all the discs has been carefully re-mastered by Harry Williamson at Spring Studios in Australia from his original master tape archive. All four discs are housed in a deluxe, full-coloured 64-page, hardback book, strictly limited to 1,500 copies. 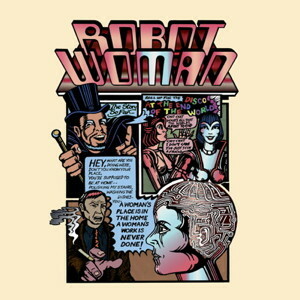 The hardback volume, heavy with content, features all of the original album artwork and original album inserts including the 15 page comic book companion to the Robot Woman 2 story, originally a large B&W poster, here for the first time in glorious full colour - something desired but beyond the budget in 1980s. A gathering of some excellent musicians, Gong's Didier Malherbe, Van Der Graaf Generator's Guy Evans and Soft Machine's Hugh Hopper add their considerable talents to Harry's engaging, intelligent, melodic jazz and even classically tinged rock on these discs. The themes explored throughout the Robot Woman trilogy are specifically female with a focus on human empowerment in the face of an increasingly technological, potentially alienating (or is it liberating?) world. Striking some timely chords in these internet and device laden days of the #MeToo movement. Some of the intellectual and moral dilemmas posed by the development of Artificial Intelligence, as it begins to gain prominence, are also presciently engaged in the Robot Woman tale. But finally, as with all things Gong, individuality and self-expression in service to a higher, intuited purpose is the guiding principle - and always executed with style and a smile. The whole project has been lovingly produced and curated by Harry Williamson. It is, without doubt, a definitive Mother Gong release, designed for Gong followers of all altitudes and all latitudes.